I had some time to kill before I commuted off to class last Tuesday. So while my niece was doing ART in my room, i took some of the water she was using and doodled on a board I stretched for another painting. I was just putting colors on the board randomly and it turned out to be this colored portrait of myself. Kinda mangaish because I really wasn’t thinking back then, but in retrospect– WHAT WAS I THINKING ABOUT? 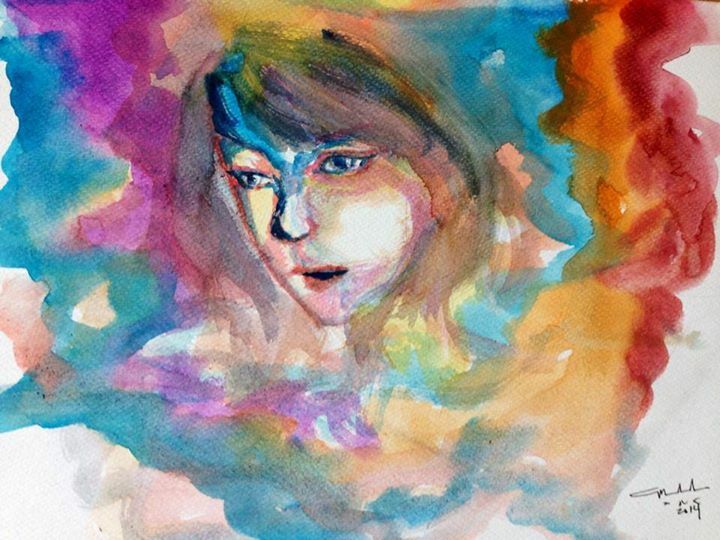 The colors really showed the muddled and colorful and many thoughts that were inside my head that day. The forms were there too. It was fun quick and satisfying. Relaxing too ! It made me feel good just before I went to class! Reblogged this on Little Miss Marikit. Wow, this is really cool–I dig your style and use of watercolors a lot–you have a lot of skill rendering bold, beautiful colors and shapes. I actually have Japanese Language classes Tuesdays and Thursdays … ^__^ and Thank you!! What do you use for your art?